This eye-catching lighting piece is shiny, playful and loud. It takes a nod from the brass section of an orchestra and is perfect for a musician’s home, a music hall, or any space in need of some elegance and flair. 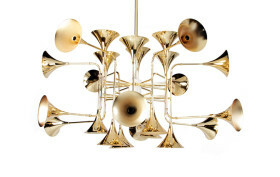 Crafted by DelightFULL’s skilled artisans using an array of trumpet bells, the Botti Pendant will jazz up any space.